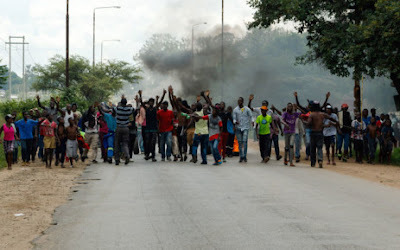 TEMPERS flared at an explosive caucus meeting for Zanu PF members of parliament last week on Wednesday when the ruling party legislators converged to discuss last week’s deadly civil unrest. The party wanted the MPs to have a common position on the state of affairs in the country. MPs who attended the meeting told the Zimbabwe Independent in off-the-record briefings that legislators strongly disagreed on how to approach the riots. Some of the youthful MPs wanted an eye-for-an-eye. They wanted to mobilise the party youths to counter the attacks. However, some of the legislators felt that the convenors of the meeting, Zanu PF chief whip Pupurai Togarepi and Justice minister Ziyambi Ziyambi, should give them the direction on how to proceed. In the emotive debate that ensued, some of the more radical MPs said the party should give them the greenlight to take on protesters as they believed that their Zanu PF marked vehicles were prime targets in the volatile situation. “Most of us warmed up to the idea that we should take the rioters head-on since they were targeting our cars. However, they were restrained by Ziyambi and Togarepi who said this would lead to an open civilian confrontation which would worsen the situation,” an MP who attended the meeting said. “Togarepi threatened MPs by telling us that we must not discuss current events as they are since he had been given parameters by the party’s leadership. MPs became very angry. Matemadanda asked Togarepi to explain why he had called the meeting when he did not want to tell the truth. He (Matemadanda) was asked to sit down and was denied the right to speak because he is a minister. He then angrily tried to walk out, only to be restrained by some of the MPs,” another MP said. “Wadyajena told Togarepi that he should not lie to the MPs that Mnangagwa gagged us, saying he knew the President very well. He said if anything, the President would want to be given accurate information about what’s happening on the ground obtaining from the grassroots. He insisted (Mnangagwa) would never want us to mislead him by sugar-coating or telling outright falsehoods. Wadyajena also said if we are genuine about solving issues, we must look each other straight in the eye and tell the plain truth,” the MP said.